I’m usually leery about crock pot recipes and I rarely search for new ones. Most recipes I have seen (or most that are popular on Pinterest), are full of canned this and packaged that…I have seriously considered creating a new pin board entitled: “Recipes that Scare Me”! There is nothing questionable in this recipe and it is so good! The aroma greeted me as I walked through the door after picking up my SIL from the air port. This was the perfect meal to come home to and I will make this again. 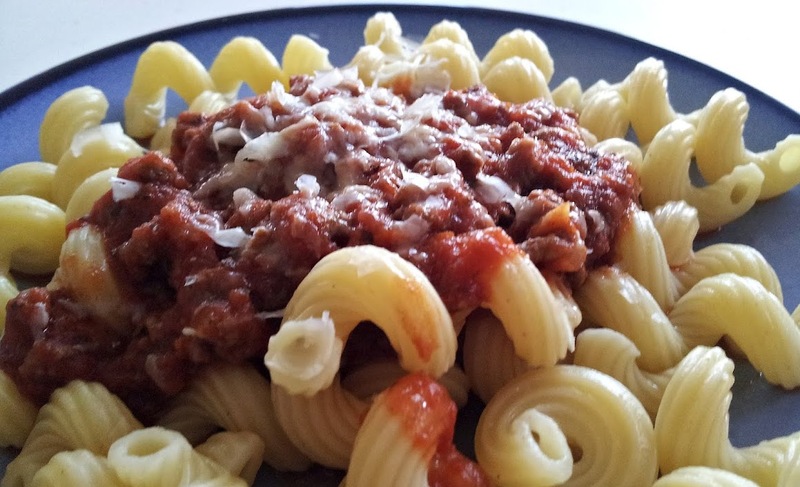 It’s rich, hearty and goes perfectly any thick, tube pasta. I served this with a quick garlic bread, but if I had more time – I would have made this one (always a favorite!) Thanks for reading, enjoy! Season ground beef with salt & pepper then brown with minced onion in a large skillet over medium-high heat. Drain then add to a large crock pot. Add all the ingredients except for the butter, stir to combine, then cook on low for 5-6 hours. Remove bay leaves, stir in butter, then serve over cooked pasta.